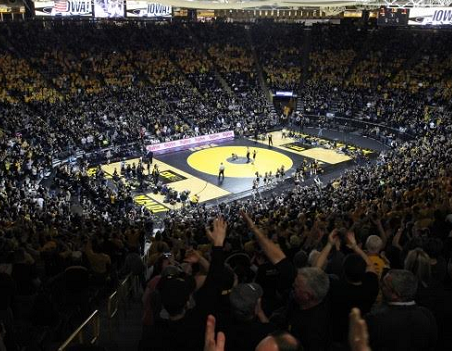 The Hawkeye Wrestling Club had a meeting in Des Moines last night for area supporters. Iowa Head Coach Tom Brands was the guest speaker. Topics included the upcoming HWC Banquet and the schedule for upcoming golf outings. Members of the HWC Inner Circle have created a new online forum at nineteen84 https://nineteen84.club/ I will get you more information on this great new platform in an upcoming Iowa Wrestling Fan blog and podcast. Guest speaker Tom Brands updated the group on the upcoming Freestyle season and the new facility. Progress is being made on the facility fundraising effort. Former Hawkeye great Royce Alger and HWC President Randy Novak were also in the crowd to talk to HWC members. Iowa Wrestling has had great support in the Des Moines area for decades. Over the last three years the support has went way up. There are a lot of people in the Des Moines area working very hard to support the HWC. Jim Sinclair has been very involved and influential in the fundraising effort for the new facility and Steve Reece has been the organizer of Des Moines area events for the HWC. It is impressive what groups like the Des Moines area HWC supporters have accomplished. Their support of the HWC is influential and appreciated. With the new facility project, overall the HWC is having more of an impact on Iowa Wrestling than maybe anytime in the 46-year history of the club. To all of the the HWC members and the Iowa Wrestling Nation, thank you for what you do. We all want Iowa Wrestling to win. The Hawkeye Wrestling Club will hold their annual banquet at the Kirkwood Conference Center (The Hotel) on Friday, May 31. There will be a silent auction beginning at 6 PM followed by appetizers. 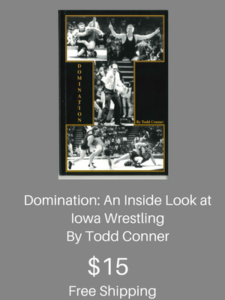 Iowa Head Coach Tom Brands and HWC coach Mark Perry will be the guest speakers. I will keep you up to date with upcoming events of the HWC on my Iowa Wrestling Fan blog and podcast. It is time to update my Iowa Wrestling Recruiting Wish List. The Iowa program is stacked and deep with talented and tough wrestlers and getting even better with the incoming committed recruits. We all know recruiting is where it is at to build a national championship team. I first saw Paddy Gallagher in person a year ago at the Iowa camp. Of all the star wrestlers on the mat, and there were a lot, Gallagher stood out to me. I cannot help but make the comparisons when I evaluate Gallagher. Is he Bull 2.0? A lot of similarities to Alex Marinelli of Graham HS. Gallagher is from a national powerhouse high school program in Ohio (St. Ed’s) and a great blend of aggression, technique, and very, very strong. It also helps that Gallagher topped the #1 ranked wrestler in the country in the Ohio state finals, but I was high on him long before that match. I see Gallagher as a career 165 lbs. wrestler. To me Paddy Gallagher is exactly what you look for in an Iowa Wrestling recruit. Jesse Vasquez is the biggest name in the Class of 2020 that has yet to commit. This guy is fun to watch and is at a needed recruiting weight of 149/157 for the Hawks. A fan noticed that Vasquez had an Iowa Wrestling duffle bag for the California state finals. 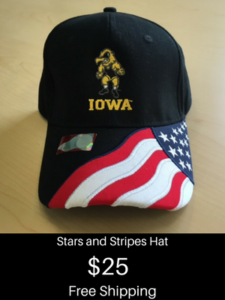 Yes, Iowa Wrestling fans get excited when we see an elite recruit with anything that has Iowa Wrestling on it. Iowa already has a very, very good recruiting Class of 2020. The addition of Vasquez would make the Iowa Wrestling Recruiting Class of 2020 great. I watched a lot of wrestlers last year in Fargo compete in Cadet and Junior Nationals. Nicolar Rivera stood out to me and he was only in 8th grade. This past season Rivera was undefeated in winning a Wisconsin state title at 106 lbs. In his toughest competition at the nationally tough Cheesehead, Rivera was 6-0 with five falls and a tech fall. Impossible to predict a future weight for Rivera in college, but it really does not matter. You are going to want Nicolar Rivera on your team. Alex Facundo is currently the biggest name on my list. Make the time to go online and watch this guy wrestle. Facundo does it all and is a great wrestler. But with his height I am thinking Facundo may be at 174/184 in college. Iowa is loaded with incoming recruits Patrick Kennedy and Abe Assad. I have no idea how it would work out, but Facundo will be a great college wrestler that everyone wants and for good reason. Even though he is at #13 in the new Flo rankings at 195, I still believe Brandon Hoselton is underrated. Another in a great class of 2021, I believe Hoselton will have a very good to great career in college wrestling at 197. Hoselton is from the same neck of the woods in Illinois that sent us Jacob Warner and has the work ethic that you like to see in a recruit. Last year it was Paddy Gallagher that stood out at the Iowa camp. This year it was Robert Avila. Let’s just say I liked what I saw out of him in a room of elite wrestlers from around the country at the Iowa camp. Being from my hometown of Lisbon, IA I am able to see Avila compete during the season. A lot of potential here and just a freshman. Wrestling for Brad Smith and being in the Lisbon program is only going to make Avila that much better. As a freshman at this time you do not know what weight Avila will be at in college, you just know you want him on your team. With the great recruits that have already committed and with Iowa having a fairly young team, I know that I do not have a long list of recruits here. Iowa does not have a lot of immediate needs except for Jesse Vasquez. Getting a commitment from Vasquez would be a huge get for the Hawks at a needed weight. I will be following along as the Freestyle season kicks into high gear. I am always looking for who I think will be the next Iowa Wrestling legend.